Well it all started in the summer months preparing food plots, checking trail cameras and hanging tree stands. Our Obsession with the buck that we called "Sticker" began on June 30, 2012 with the first picture of him in velvet showing a sticker coming out of his right brow tine. Mike Hawley (Co-owner Turkey Hill Outdoors) and I both started to make him our priority buck as more and more pictures of him began to show up here and there on our cameras. Being a college student, I don't get to get in the woods as much as I'd like to for Bow season so the morning of October 20th was only the 4th day I'd been in the woods. I decided to hunt the food plot stand on the morning side that morning and Hawley would hunt the original "morning stand." After forgetting my Hunting Boots and Backpack behind and climbing into the stand a little late, it seemed like things just weren't going our way that morning. But, I had my camo, my bow, and our "Bust-a-Buck" deer scents, which was just enough to still feel comfortable sitting in the stand. We quickly sprayed their doe in estrus and young buck sprays and climbed into the tree as fast as we could. After sitting for maybe 10 minutes, "Sticker" walked right up rubbing some trees making his way towards my stand taking his sweet time. This thankfully gave me some time to calm down after realizing it was him and gave me a 21 yard shot to the lung/liver. He went about 300 yards and piled up. It took us a little to find him, but it was all worth it to put my hands on the now infamous deer. It was an amazing experience that I will never forget and I'd like to thank everyone who made this opportunity possible. A shoulder mount is being made by Mike Macey of Macey's Taxidermy. 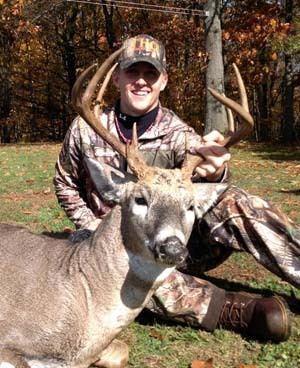 Mike's Broome County 9-point was rough measured at about 125. The buck dressed out at 164 lbs and has a 16 inch inside spread.